For productive, efficient & faster coding we all need a comfortable as well as advanced text editor. 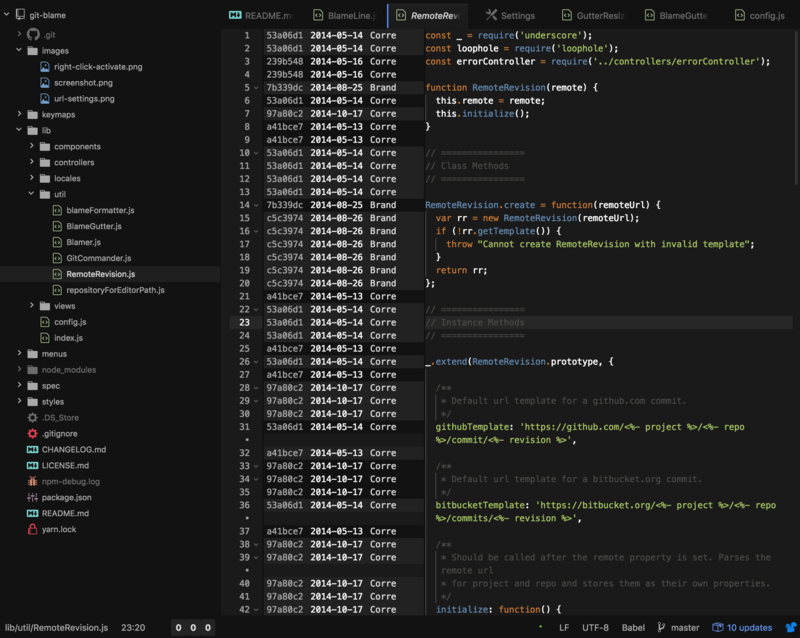 Atom, a text editor developed by github, keeping every programmers capacity in mind. From beginner level programmers to super nerds atom is the perfect one for all. Approachable, modern yet hackable to the core & one can customize it according to the need, everything a nerd may ask for in a text editor. It’s long listed advanced features doesn’t make it hard for beginners to work on it, they can easily use this in a productive way without even touch any of the config file. Why atom is a better text editor? There are some major reasons why programmer loves working with atom. It comes with some useful and beneficial features improving the way of coding. Here are 6 major reason i found attractive in atom. Easy to use, cross platform text editor: Windows, Linux or OS X, whatever you might be using, atom is for all. Built-in package manager: Not only you can search & install the required one but also can create of your own. Smarter auto completion: Atom helps you write faster code by providing auto completion facility. File systme browser: In a single window you can browse & open a file, a whole project or even multiple project. Multi panes: The atom interface can be split in multiple panes. Simple search: Atom has focused on simplicity a lot. You can easily search, preview or even replace texts in few seconds. Before jumping there lets find out what is a package? Why do we need them? What is an packages ? Why do we need packages ? A package (or plugin) is a small external software program (a piece of code) consisting its own features & uses that can be installed to a valid software or program to modify and enhance the ability or functionality of the software or program. Adding some particular package in atom text editor will help increase the working ability, easiness and efficiency of the editor. Both downloading and installing of a particular package in atom gets done in just few clicks and the best part is one can even create their own package according to the need. How to add a package in atom? No headache, just few clicks and your job is done. Below you will find step by step process of downloading & installing an package in atom. Step 1: Launch the atom. Press ctrl+, for opening up the settings view. Step 2: Click on install. Step 3: Search the required plugin. Step 4: Install it. Once the plugin/package has been installed you can see it under the ‘packages’ tab. There are almost 7000 packages available in atom, most probably you will find the one you are looking for. Snippet is a programming term that suggests a small region of re-usable source code, machine code or text. Reduces chances of syntax error. Can import an entire module’s content or even a part of it. Can import single or multiple member of a module. Generating getter or setter property and many more. Emmet is the most popular HTML & CSS code snippet among front end developers. You can even easily extend Emmet with new actions and filters or customize existing ones. If you are conscious about your time, emmet is must. Multiple cursor support: most Emmet actions like Expand Abbreviation, Wrap with Abbreviation, Update Tag can run in multi-cursor mode. Interactive actions (Interactive Expand Abbreviation, Wrap With Abbreviation, Update Tag) allows you to preview result real-time as you type. Remember, you must install linter package to use Linter-JS-Standard. Support standard, semistandard and happiness styles. Support ignore glob patterns in package.json. Support custom parsers in package.json. Support global variables in package.json (supported by standard and semistandard). Support fenced code lint in markdown files. Toggle git-blame annotations in the gutter of atom editor. This package helps you to keep a track of the changes or modifications done by your group members, who-when did the modification etc. In order to toggle the git-blame annotations press ctrl + b. Easy to keep track about the person who did the change in the git repository. Timing records can also be found. In short, the Git-Plus plugin lets you do git actions without changing the terminal. Make commits and other git things without the terminal. Notifications will appear in a console output above the status bar. This view can be toggled by clicking the ‘git+’ icon in the bottom right of the status bar. Auto fetch, keeps your local repo bang up to date by automatically fetching from all remotes in the background every minute by default. Script allows you to run & test a particular block of code. To check if some lines are working properly we don’t have to run the whole code every time. Can run a particular block of code. Execution of code directly and within atom. Switching between editor and browser again and again is surely irritating. Specially beginners need to search random stuffs every now and then while coding. Ask Stack is not only for JS, but very useful for any developing task in atom as you can quickly get answers and code samples from Stack Overflow directly in Atom editor. So if you are a novice programmer can try this one comfortable learning & coding. Insert or copy code samples with the click of a button. Easily browse between questions and answers. Sort by relevance or votes. Access to the number of votes, tags, accepted answer and more. Writing your code in a proper structure is very important, it increases readability and makes it easier to understand the code for you and others. Atom-Beautify makes the task easier for you. Gives code proper structure & increase readability. A very simple yet useful atom package. Highlight selected, as the name suggest this plugin highlights the current word selected when double clicking. Makes a particular word visible easily. Remembering or copy pasting the whole path is not a comfortable practice of coding. Autocomplete-Paths will automatically suggest the path name you are looking for. Very efficient thanks to caching and incremental cache rebuilds. (incremental builds are disabled for Windows. Please use the Rebuild Cache command.). When it is about memorizing something, the lesser the better. It happens a lot that there are some unfinished task we are keeping for upcoming days, TODO-Show is the best atom package for maintaining better task doing. This package helps you revealing the comments having keywords like TODO, CHANGED, FIXME. You can even add your own keywords. Provides nice, readable overview list. Five different scopes (workspace, Project, Open file, Active file, Custom) are available to narrow down your search for todos. Documentation is an integral part of coding, specially when you are working in a group a proper documentation is must. Docblockr is a great documenting plugin for atom. Makes documentation easier & faster. If you have found any other helpful JS atom package which has not been included in this list, please let us know in the comment section. Ctrl + “,” did not work for me to open up the settings view. “Command” + “,” worked for me.